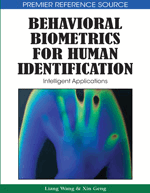 In this chapter the Authors introduce the concepts behind the mouse dynamics biometric technology, present a generic architecture of the detector used to collect and process mouse dynamics, and study the various factors used to build the user’s signature. The Authors will also provide an updated survey on the researches and industrial implementations related to the technology, and study possible applications in computer security.In this chapter, we investigate repetitive human activity patterns and individual recognition in thermal infrared imagery, where human motion can be easily detected from the background regardless of the lighting conditions and colors of the human clothing and surfaces, and backgrounds. We employ an efficient spatiotemporal representation for human repetitive activity and individual recognition, which represents human motion sequence in a single image while preserving spatiotemporal characteristics. A statistical approach is used to extract features for activity and individual recognition. Experimental results show that the proposed approach achieves good performance for repetitive human activity and individual recognition. Repetitive human activity involves a regularly repeating sequence of motion events such as walking, running and jogging. Most existing human activity recognition approaches detect human motion in visible spectrum. However, it is very likely that some part of human body or clothing has similar colors as the background colors. In this case, human motion detection using currently available approaches usually fails on these parts of the human body. Moreover, the existence of shadows is a significant problem in the visible spectrum. In addition, sensors in the visible spectrum do not work under low lighting conditions such as night or indoor environments without any light. To avoid the disadvantages of using sensors in the visible spectrum, we investigate the possibility of using the thermal infrared (long wave infrared) sensor for human activity analysis and individual recognition. Unlike a regular camera which records reflected visible light, a long wave (8~12µm) infrared camera records electromagnetic radiation emitted by objects in a scene as a thermal image whose pixel values represent temperature. In a thermal image that consists of humans in a scene, human silhouettes can be easily extracted from the background regardless of lighting conditions and colors of the human surfaces and backgrounds, because the temperatures of the human body and background are different in most situations (Arlowe, 1992). Figure 1 shows an example of a walking human at different time of a day recorded using a thermal infrared sensor: noon (first row), late afternoon (second row) and night (third row). There are no obvious thermal shadows introduced in the thermal infrared images recorded at noon and late afternoon. Thermal images also have high contrast between the human and the background at night. In this chapter, we investigate repetitive human activities and individual recognition in thermal infrared imagery. First, human motion is detected and human silhouettes are extracted from the background. Then, we employ an efficient spatio-temporal representation, called Gait Energy Image (GEI), for repetitive human activity and individual recognition. Unlike other representations which consider motion as a sequence of templates (poses), GEI represents human motion sequence in a single image while preserving essential spatio-temporal information. Finally, we use a statistical approach based on principal component analysis and multi-discriminant to extract features from GEI for activity and individual recognition. In section 2, related work on object detection, activity and individual recognition is presented. Gait energy image based representation of human motion is discussed in detail in Section 3. Statistical approach for recognition of activities and individuals is presented in Section 4. Experimental results are presented in Section 5. Finally, conclusions of the chapter are provided in Section 6.